We were saddened to learn of the passing of documentary filmmaker Robert Drew on July 30, 2014. While Drew had a long and distinguished career that went beyond his connection with John F. Kennedy, we pause a moment to recognize the importance of his three Kennedy documentaries, Primary (1960), Adventures on the New Frontier (1961), and Crisis: Behind a Presidential Commitment (1963). In the late 1950s Robert Drew developed new film technology that would change how documentary filmmaking was produced. His innovation—a handheld camera that filmed action in sync with the sound—made it possible to look in on historic events in a new way, as they were unfolding. While today this method seems like second nature, in the late 1950s it was a giant step forward in film technology. Drew’s documentary Primary followed Democratic presidential candidates John F. Kennedy and Hubert Humphrey through the 1960 Wisconsin primary. It was groundbreaking in its “you-are-there” nature—a genre now known as cinéma vérité. Drew followed that film up with a documentary portraying President Kennedy’s inauguration and his first months in the White House; this work, Adventures on the New Frontier, candidly followed the President’s actions in the Oval Office. 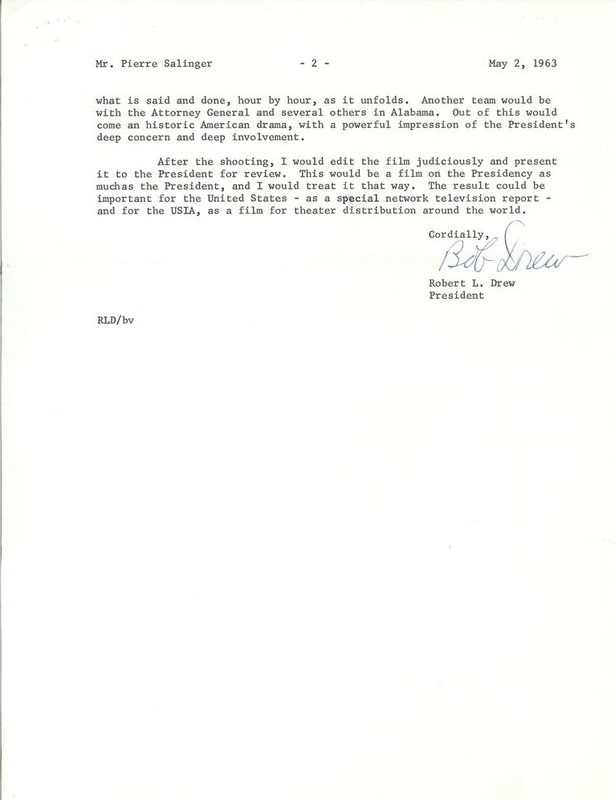 Memo from Robert Drew to President-elect John F. Kennedy regarding the logistics of filming the President’s inauguration and transition, 30 December 1960. View the digitized folder of material here. The “fly-on-the-wall” nature of Drew’s filmmaking was brought to full force in Crisis, which told the story of the integration of the University of Alabama from the perspectives of both the White House and the citizens of Alabama. Drew’s request to film this event was initially rejected. 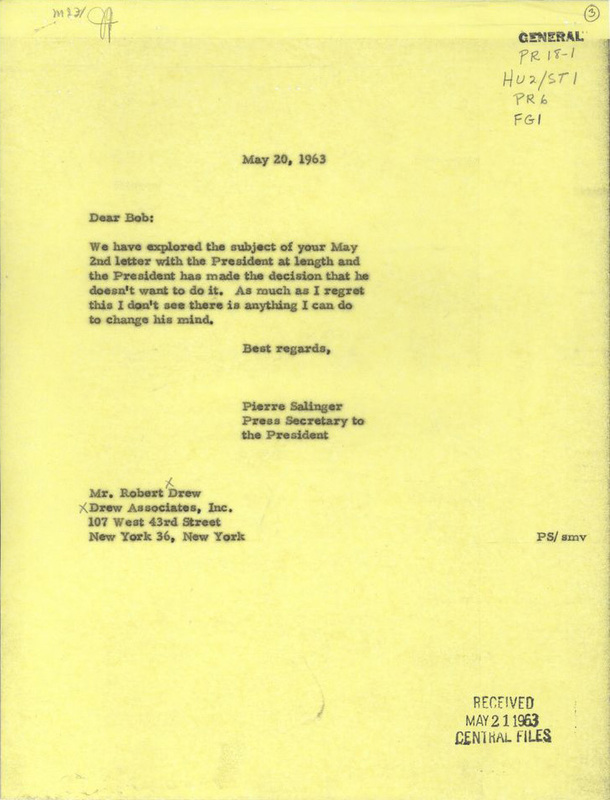 Robert Drew’s initial inquiry to the White House about the filming of Crisis, 2 May 1963. View the digitized folder of material here. 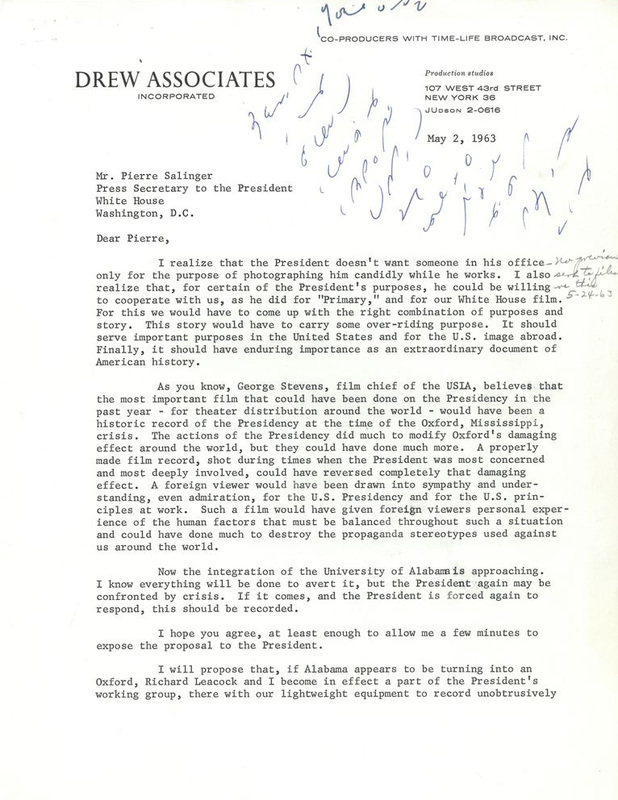 Letter from White House Press Secretary, Pierre Salinger, to Robert Drew, rejecting the proposal to film the President’s handling of the crisis at the University of Alabama, 20 May 1963. View the digitized folder of material here. 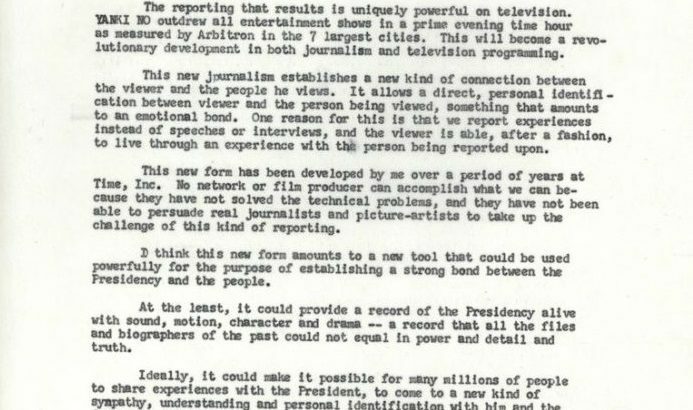 We cannot find written evidence showing that President Kennedy changed his mind about the filming of this event, though clearly he did. 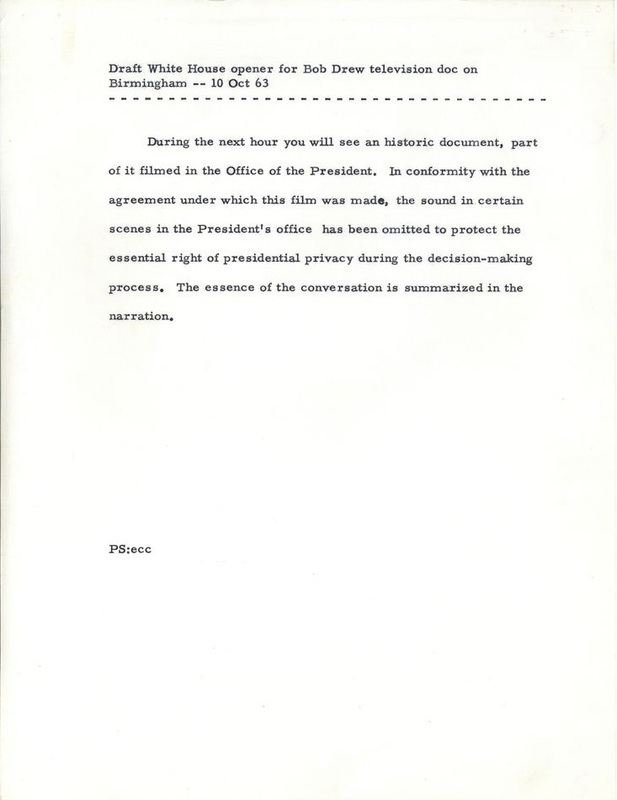 Crisis captures important conversations and decisions made by President Kennedy during one of the most intense domestic disputes of his presidency. 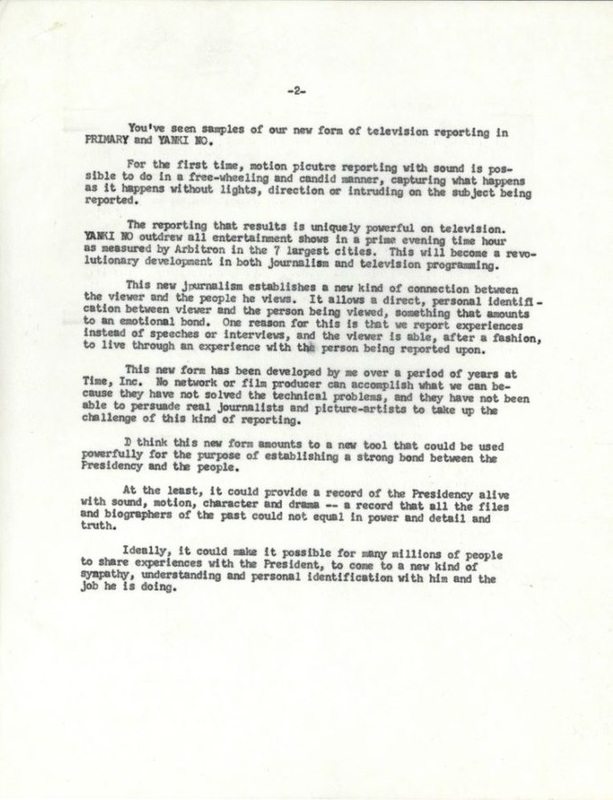 White House draft opener for Robert Drew’s forthcoming documentary Crisis, 10 October 1963. Additional narration and transcriptions of film segments can be found here. We have copies of all three of Robert Drew’s documentaries on John F. Kennedy and anyone is welcome to make an appointment with the Audiovisual Reference Unit to view them on-site. 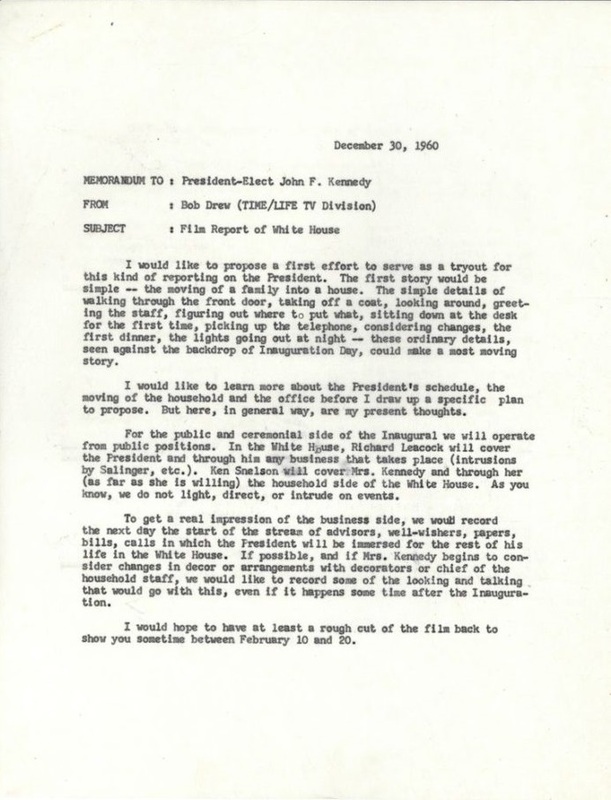 Please email JFK.AVArchives@nara.gov for more information.